Really appreciate that from the bottom of my heart. Here is the latest version of the app. This is what you've been waiting for :D.I am a promise keeper :). Here below is a game play video, play'ed on my Samsung S3. THEN MUST WATCH THE BELOW VIDEO. This update is for the users getting crash each and every time when they start "Quick play".How to play? "Join quick play game, just start killing other players with the default gun you have in your hand at the spawn time.Keep in mind that, you just have to shoot once and it will kill the enemy as u shoot, it fires about 5 bullets at the same time. NEVER EVER CHANGE WEAPONS, I MEAN PICK WEAPON FROM THE FLOOR.IT WILL CRASH YOUR GAME. "Lemme explain a bit.Hope you read the words "One shot dead" in the title.Lemme explain that for you.I have reverse engineered the mini militia game library to fire 5 bullets, when you shoot once.You may see the thickness of bullet regarding to original game.Its thicker than the original game, when we fire the bullets.I used to play with just a Deagle or Colt 45(I don't know the gun's real name :D).Never use guns that does rapid fires such as M4 or MP5 or AK47.I highly prefer not to switch weapons while playing in online mode.As it tends to crash the game, because we know that our guns got unlimited ammo and I have programmed the ammo section in the game to give unlimited bullets by just pointing the R7 register(That's a bit technical, don't worry. ).So when u switch the guns, your gun with unlimited ammo will be dropped down, some servers in Mini militia can't hold the large number and it crashes your app."" As we know, Mini Militia has recently rolled out a newer version of their app, version'ed 2.2.15 with lots of mind blowing doodle characters and maps and features. As you know, the previous version(2.2.9) of the app's modified apk has been already released "Mini Militia v2.2.9 - Unlimited Health, Flying power, Ammo, One shot dead, etc for Android - WORKS ON MULTIPLAYER".But unfortunately, the old modified library will not work with the latest version (2.2.15) of the application, as lots of features and internal performance modulating code has been added into it. 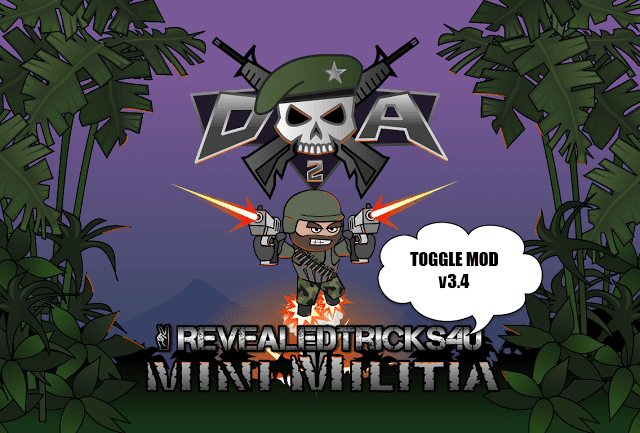 Please consider visiting this link(http://www.revealedtricks4u.com/2016/02/mini-militia-doodle-army-2-unlimited-health-flying-ammo-oneshotdead-multiplayer-android.html), as the steps are already mentioned there. The apk removed due to copyright violation. 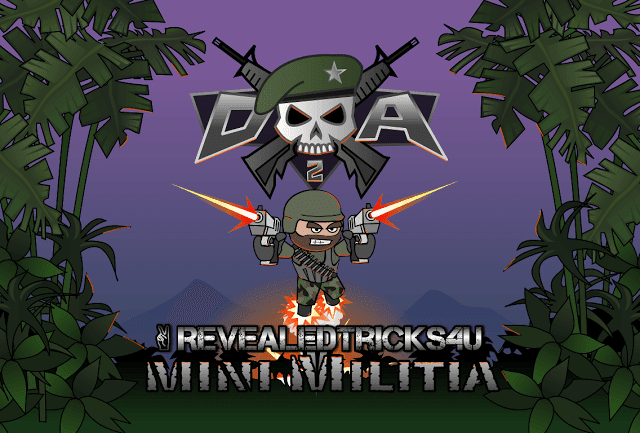 Please look at this link "http://www.revealedtricks4u.com/search/label/minimilitia" to get the latest app which brings fantastic features. Once again, thanks for your support guys. Share this to your friends, just by clicking on one of the box in the left side and have fun :D.
Stay tuned for more updates, keep visiting :). I like your hard work . because you DID what you promised us..
Its very appreciated awesome work.. :) ..
Where is LIB file ( my phone already have rooted ) ? I dont want you to be Embarrass again... ;) its ok .. I have just downloaded this apk. Just call me Shihab and you don't have to prefix with Mr and suffix with sir :D.
Just see me as your friend. Only uploaded the apk file as I have changed some internal classes inside the Apk and some resources too.So just by changing the lib file may not work. I don't think you will face crashes, If you have followed my comment in the previous post. I prefer 'bro' than 'sir' as its kinda bossy type :D.
Please read the updated post.I have added an How to play instructions for those users getting crash. In the meanwhile, I will try uploading a game play video.So you guys will know how to play without getting crashed. Bro Can you please update the modified apk in which we can toggle the mods ON and OFF. Thanks in advance bro. This is the best ever hack i have ever found and thankyou for being such a good person for replying to every comment. Thanks for your appreciation, you guys are the most precious one for me regarding to this blog.Without you guys, I might not able cope up with this site. You've just read my mind :D.I was just started thinking of creating a toggle'able version of this app, even though that's pretty hard.I will do it for you guys. Keep visiting and don't forget to subscribe to grab the new version, soon.Don't forget to share with your friends. Bro what is the software that you used to reverse engineer this app? Is it IDA?  I am just soo excited to play with some code. Thanks in advance. And is there any way to contact you directly like facebook etc. My email is [email protected] Thanks in advance. Please use the below link to contact me, personally.I will do my best to guide you out. If you are getting like Server Notification with an error number.Then just press the Home button and directly clear the app from the recents list.Don't quit the app by pressing back button instead just force kill it by clearing off the recents list.As far as I know, there is no banning system on Mini Militia servers and you won't get blacklisted or banned. And stay tuned for the toggle'able version of this app(Pressurized by visitors to make one). Is this what you've been waiting for ?.;). Hello Shihahabudeen sir I like your hard work. I will not download the mods as it requires root and whenever I root my tablet it crashes am just asking if later new version of mini militia comes will you post it the link without root. I thought of releasing a mod which is supported for non-rooted phones, will be released soon.